Okay before I can start I have to mention the title. While most of the other Teen Mom's have now written books, their titles connote strength and self-discovery. Farrah Abraham clearly feels like her daughter practically ruined her life. 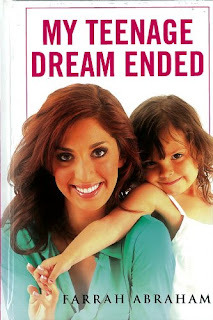 'My Teenage Dream Ended' is a title portraying the loss that Farrah felt when she had her daughter, Sophia. As she pointed out though in a Twitter debate, she is the only Teen Mom to put a photo of her daughter on her book...contradictory? The book mainly focuses on life before Sophia and the love she had for her baby daddy, Derek. We all know the story from both 16 and Pregnant and Teen Mom so although it was nice to see how she feels in words, it was kind of a drag. She does go on to explain how close she is to Derek's dad which is nice but again, we learnt that from the show. I've never understood how she was still so in love with Derek even though they were not together when he died and not just that, she didn't tell him she was pregnant. He dies late in the pregnancy at 7 and a half months and she never told him he was the father. He learnt she was pregnant through mutual friends. I find the whole situation rather strange that as soon as he dies, she's madly in love with him again. Not only that, but while together the relationship was on-off and when off they would make each other jealous by kissing together people. To each their own but that's not a stable relationship. The one event she really open's up about is the relationship between her parents. How they were arguing as she grew up, not really there for support and let her be a wild child as they had little parental responsibility explains one of the reasons for the way she comes across in the shows. They definitely weren't a role model for how relationships should be. Her attitude is a sign of her strength and the wall she has had to put up to protect herself from being hurt again. I don't think that there's an awful lot going for this book. I didn't highlight any key points or any nice quotes, I didn't leave the book feeling anything but emptiness. I didn't fall in love with Farrah and although at parts I may have felt sympathy, the story was so repetitive it was lost. Having watched Farrah spend time with her daughter recently, I hope they make each other happy. You can tell how much Sophia supports her mother and is totally protective of her. Best of luck with Farrah and her business enterprise, as long as her and Sophia are happy, that is all that really matters.